. Hello, my name is Halle. Disney has been an amazing part of my life from a very young age; I was the little girl who dreamed of becoming a Disney Princess. I am a former Disney Cast Member of nearly 15 years, working with Radio Disney and then at The Magic Kingdom, Walt Disney World. I am a wife and mother to a precious daughter, who is already showing a love for Disney. 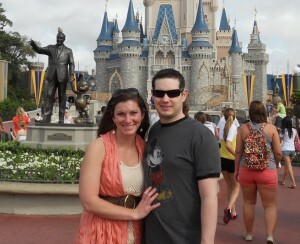 I have so many wonderful memories made at Walt Disney World and Disney Cruise Lines. From family trips as a little girl to spark my love for it, to working right on Main Street USA, getting engaged in the Rose Garden, honeymooning at WDW and a 7 night Western Caribbean cruise on The Magic, to announcing we were having a little girl in front of Cinderella’s Castle, Disney vacations have been a magical part of my life. We vacation nearly every year at Walt Disney World and have our third Cruise booked for October! This will be our daughter’s first Disney Cruise and trip to Walt Disney World! I am sure this will be our most magical trip yet! I have stayed in each category of Resorts at Walt Disney World and dined in numerous locations all over the parks and resorts. I have attended Candlelight Processional, Mickey’s Very Merry Christmas Party, Epcot’s Flower and Garden Festival, Epcot’s International Food and Wine Festival, Night of Joy, Rock the Universe, Mardi Gras, the now retired Pirate Princess Party and other special events throughout Walt Disney World and the Orlando Area. As your personal travel planner I can help you determine which resort works best for your family, which time of year to go. Schedule your Fastpass+ reservations, Set up you My Disney Experience Account, Order your Magicbands. Help you decide which Restaurants to go to and make your Advanced Dining Reservations. Give you tips on the best parade and fireworks viewing spots. Help create an itinerary of your must do’s for each park and give suggestions based on your family. I can help pick the best cruise itineraries and excursions to meet your families interests. I will be there every step of the planning process to ensure you have a wonderful vacation. I would love to help your family make magical memories that will last a lifetime.